Booking a transfer from Faro Airport to Vilamoura, How it works? All the transfers must be booked before you arrive at Faro, Lisbon or Seville airports. Using our booking form make the selection From Faro to Vilamoura, select the number of persons and the price will be calculated accordinglly. It will inform you the travel time and the distance Faro to Vilamoura. Enter dates, flight arriving and departing times. The pickup From Vilamoura to Faro will be calculated to be in Faro Airport 2 hours before the flight time and 2.5 hours to Lisbonne and Seville Airport. The transfer price to Vilamoura when confirmed is guaranteed by Ttaxi Travel. To confirm your booking Ttaxi Travel sends a confirmation voucher with all details to your email address. We will be in Faro airport to your arrival and on pickup time to bring you and your family back from Vilamoura to Faro Airport. Vilamoura is an unincorporated area in Algarve, on the southern coast of Portugal. It is one of the three corners of Algarve's Golden Triangle. 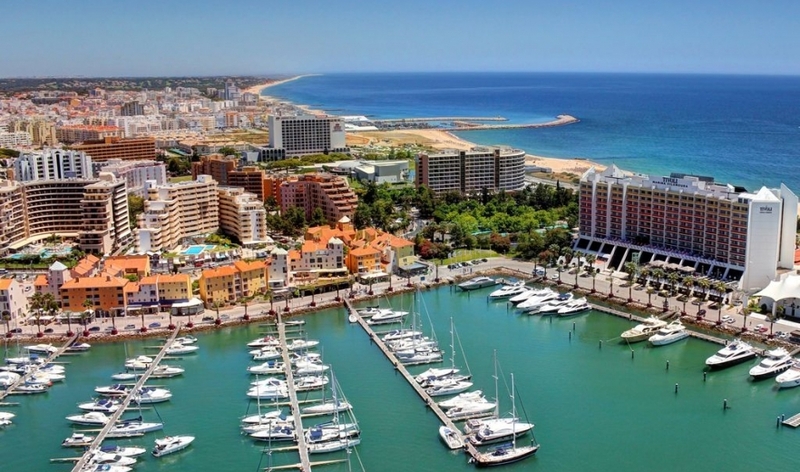 Vilamoura comprises one of the largest single tourist complexes in Europe and with about 2,000 hectares of land. The nearest airport is in Faro. Advertise your holiday accomodation in Vilamoura Algarve with Ttaxi Travel. Beautiful pretty pink 5 bedroom villa located in the heart of Vilamoura set within a lovely garden, a big private pool, outside space and Barbeque area.